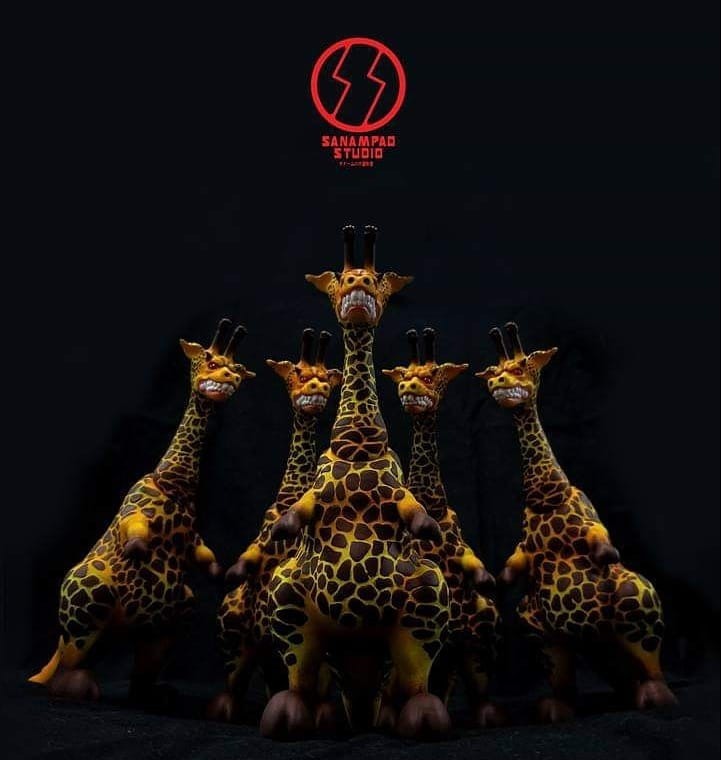 Thailand's Sanampao Studio is accepting orders for the debut edition of their Great Giraffasurus resin (7.8"). Standing tall against the onslaught of bunnies, cats and other cuddly animals, this mighty giraffe offers a refreshing break from art toy trends. Likewise, instead of a gentle, graceful profile, this hefty beast is ready to roll with enraged, blood red eyes and bulk to back up the 'tude. Limited to 15 pieces, the hand-cast and hand-painted Great Giraffasaurus features magnetic articulation at both the base of the neck and the head allowing him to look side to side as well as downwards as shown in the photos after the jump. The figure is available for $129 and includes two stickers and a card and comes in a fancy full-color box (nice touch). To order send a DM to the Sanampao Studio on Instagram. First shown at DesignerCon, the new Eternal resin sculpture by Spanish painter Dulk draws his captivating art from the canvas to the display case. Created in conjunction with Thinkspace and Silent Stage, the sculpture is based on the original painting of the same name which was shown at Thinkspace's Scope Miami show during Art Basel weekend in December. Eternal features a guardian Rhino spirit, protecting the species and the natural world. 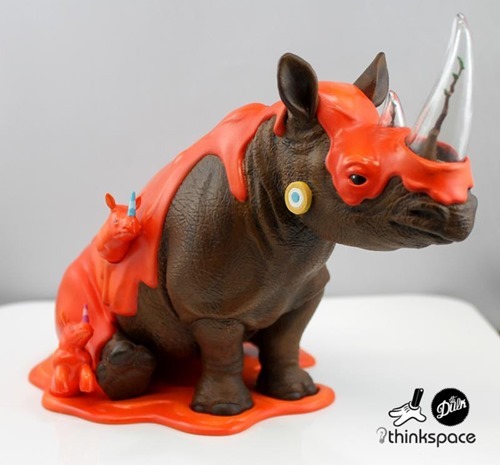 The guardian appears to give life to the rhinos from his essence, depicted in vivid orange. Another highlight of the piece is the pair of translucent horns which shelter plants within. From the vision to the sculpt and the paint treatment, Eternal impresses. An edition of 100, Eternal by Dulk (8" tall x 11" long) is available for pre-order now for $499.99 each direct from Silent Stage. Each sculpture includes a signed and numbered Certificate of Authenticity. Based in Korea, the Rollis project is creating a stylish world inspired by retro European cars. 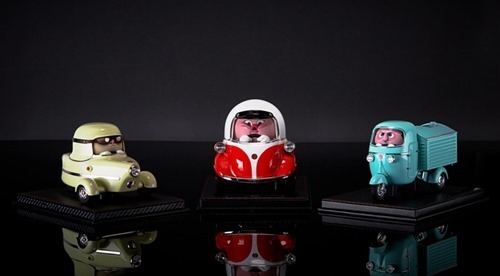 So far, the fictional, old-is-new motor company offers an eclectic, fun selection of models for y our driving pleasure, including the Iso Isetta, Inter 175A, and the oh-so-cool Piaggio Ape. Each of the Rollis designs feature CG-style drivers wedged into the teeny, tiny cars. In addition to producing super glossy 1:18 resin versions of the cars, Rollis is also working on a CG-animated short which from the teaser looks to be top-flight as well. To make their retro dreams come true, Rollis has launched a Kickstarter, ending on February 13th, with several rewards including the car toys which are available for $269 each. The cars are available in a selection of colors and are limited to 20 per color. Each features eight coats of spray + a UV clear coat and for better or worse, a fixed plaque-style display. With Rollis' work on the CG short film, and the high-gloss, pristine images of the resin toys, we've wondered whether the resin toys would live up to the pics on their IG and now, Kickstarter. While we haven't seen them in person, photos from their display at the recent Hong Kong Toy & Game fair are quite promising. 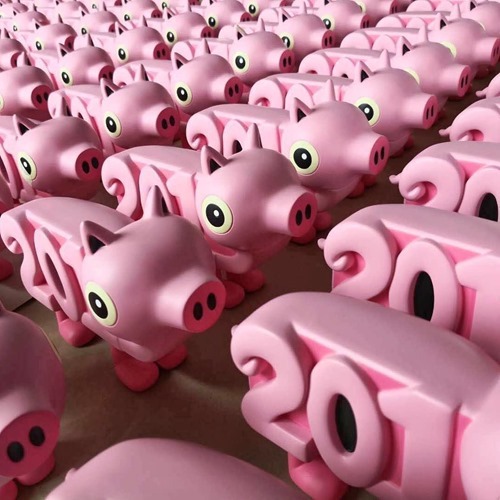 It turns out that the new 2019 Year of the Pig polystone figure from Jeremyville and Yo!Toy will in fact be available outside of China. Thundermates, the producer of the piece, will release a limited quantity of the fun figure on Tuesday (1.22) at 7 AM PST for $165 each from their web shop. Limited to 200 pieces, the figures comes with a Certificate of Authenticity. In addition to numerous roles in martial arts and action films, Gerald Okamurau, The Man of Many Weapons, has also been the subject of several art toys from Hyperactive Monkey, Max Toy Co and others. Now, Flabslab has just released their new Big Trouble resins featuring Okamura in his dual-pistol glory from arguably his most celebrated role. Sculpted by Rich Page, Big Trouble is a strong, stylish translation of the movie character with plenty of layered, 3D-detail and crisp paint. 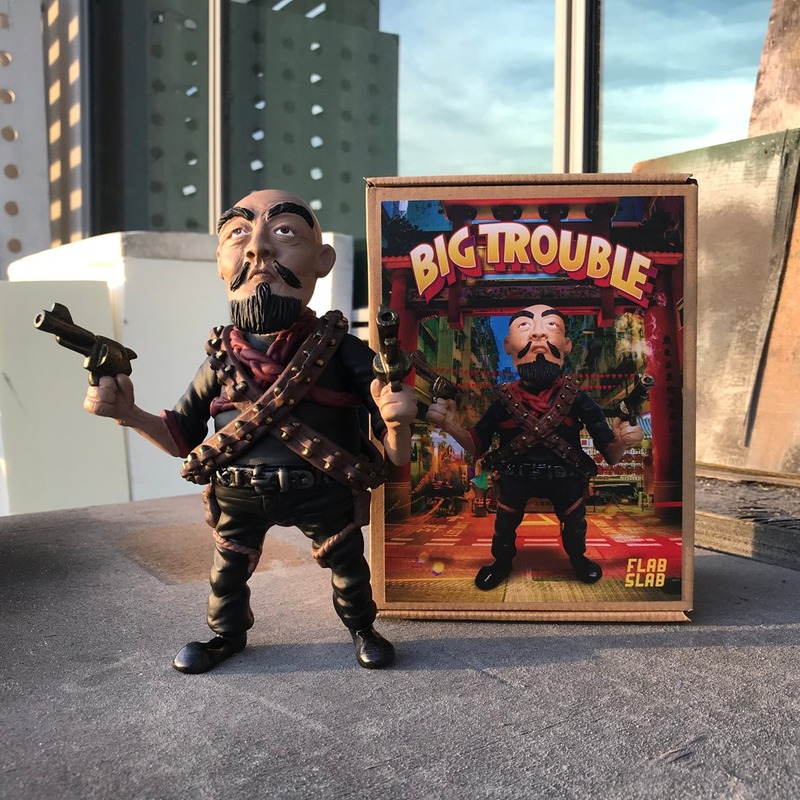 Limited to 20 pieces, the 7.5" Big Trouble resin figures are available now from Flabslab for $130.